So I went in for my second-ever surgery yesterday. I first wrote about the problem here. It was extremely minor, especially compared to my first surgery, which was for appendicitis. 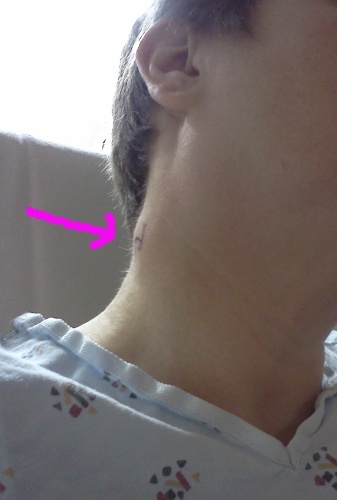 Just a slice into my neck to pull out a strange lump to be checked for malignancy. 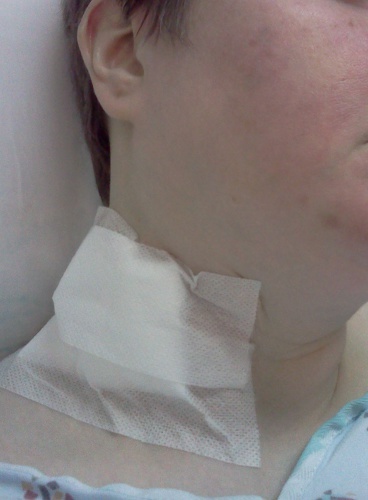 The short version: It went well, but neither the surgeon and the pathologist who came over from a larger hospital could identify why the lymph node was enlarged, so the thing will be undergoing more testing. In the meantime, I've got some serious painkiller if I need it and a bandage that can come off later today. Click for a bigger version. This is my CT Scan picture, taken with a cell phone camera from the screen in the doctor's office. 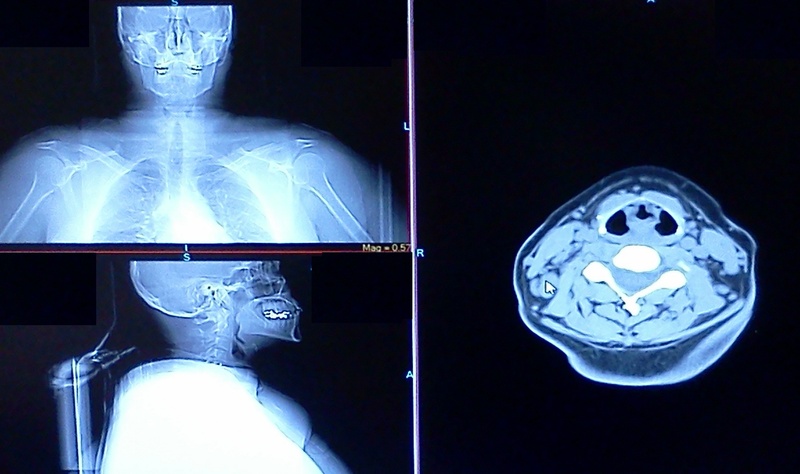 The thing on the right is my neck (imagine you are looking up at a bi-section of it, with my throat at the top), and the cursor arrow is where the lump was. Pre-op was pretty simple. No daily aspirin for the week leading up to the surgery. No over-the-counter medicines, particularly anti-inflammatory medicine, for the two days before the surgery. The night before the surgery I took a heavy-duty shower and scrubbed the site of the incision for five minutes with anti-bacterial soap. Five minutes is a long time when you are scrubbing. I had to fast for 12 hours before the operation, and I ended up taking my final drink of water about 10 p.m. Wednesday night. No medication, no breakfast, no water until after the operation. I was awoken nice and early by Inkwell yesterday. I went back to bed pretty quickly and didn't get up until about an hour before I had to go to the hospital. A friend (THANK YOU SARAH!) came to take me to the hospital. To my surprise, I didn't stay long in the waiting room, but I did have a good long wait in the pre-op rooms. Fortunately, I also had my cell phone for tweeting and for reading on my Kindle app, so the time passed pretty quickly. 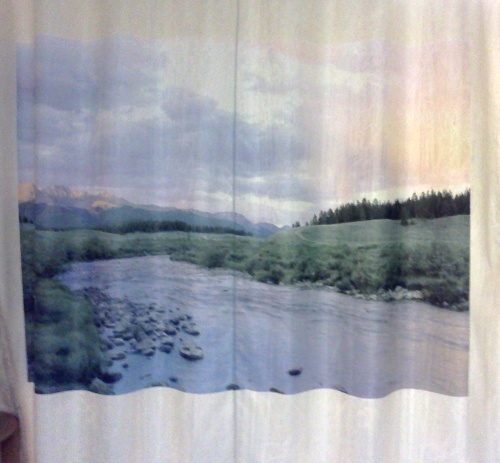 The pre-op/post-op recovery room had a nice design on the curtain. The overhead light had a cloud insert as well. It was a comfortable little place. In the waiting room I had to change into the really flimsy gown they provide, but as soon as I was changed, the nurse brought in a blanket that had been in a warmer and covered me up. 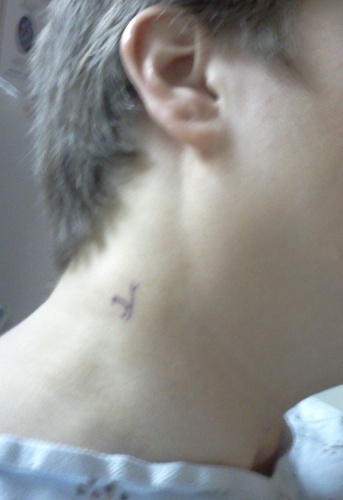 I had my vitals checked, and then I had to mark where the lump was on my neck. The nurse said I had to do it myself, and I ended up marking a bit of my hand as well because the spot was kind of awkward for me. Right side, under the ear but back a little. Being right-handed, it was difficult to mark. Later the surgeon came in and initialed the spot as well. It's harder than it would look to make a mark on your own neck. But at least I found the spot and got it marked. Yay. I spent quite some time reading and listening to other people going into surgery or recovering from surgery. I had the option to watch TV, but I had no interest in it. I preferred my Kindle app and the occasional tweet outward. I decided against using my precious data minutes to check e-mail or Facebook, so I was a little isolated. The nurse finally came in and put the IV in. She said, "Here's breakfast!" I was expecting it to be as bad as the IV for the CT Scan, which left a bruise that still looks impressive a week and a half later. That one wasn't actually painful, but I do tend to get these wonderful purple colors whenever anyone tries to put an IV in me. So far this one has been not as impressive, but there was a moment when she put a numbing agent in that really stung. Like a particularly nasty bee sting. Once it took effect it was great. But there was that moment, yikes! After the IV the operating room nurse, who knew me from church, came in and chatted with me about the process. The whole thing was starkly different from my last surgery from here on out. I remember when I was put under for the appendicitis it was done in the emergency room and I woke up in a bed in a regular room. I also remember the anesthesiologist talking to me to reassure me during that emergency session, but this time the guy had time to introduce himself and ask a bunch of questions. He also promised me something for the anxiety, which I apparently wasn't really showing much but I told him about. The surgeon popped in to sign the spot that needed cutting, then I got to walk to the operating room with the nurse. She introduced me to the other two nurses in the room, and told me I didn't have to remember names, there would not be a quiz. Thank goodness, because I don't remember any of the names now. They got me to lay down, did some adjusting to make sure I was comfortable and the spot on my neck was prepared, then the anesthesiologist said he was adding something to my IV for my stress. A couple of minutes later they put the mask on me. Then the anesthesiologist said to take four or five deep breaths and I would fall asleep. After four I was a little indignant that I wasn't asleep yet, but I don't remember reaching number six and only vaguely recall five. I dreamed. I don't remember the dream, but I know I dreamed because when I woke up I was reaching for it and thinking, "No, don't go yet!" and trying to pull it back into my memory. When I dream in regular sleep I can often hold onto the dream for a few minutes, long enough to write it down if I want. This one fled too quickly. But it was a good dream. Perhaps an excellent dream, because I woke up really really happy. Maybe it was the morphine, but I don't know. I was in a fantastically good mood when I woke up. I heard a male voice, perhaps the anesthesiologist, talking behind my head to the recovery room nurse. He said the operation was 42 minutes long and that they didn't wait for the pathologist to report before closing me up. I remember the first thing I said was that my toes were cold. They put a blanket from the warmer on my feet and that fixed it. I also could hear a patient in the bed next to me, call him Jose. He was in pain. I heard them asking what the pain level was on a scale of 1-10, ten being worst. He said six. He also said his mouth was very dry. I heard the nurse explain he couldn't drink just yet, but she could moisten his lips and mouth with a sponge. I became aware that my mouth was incredibly dry and I wanted a sponge too. I felt really sorry for Jose and hoped the painkiller worked for him. The nurse asked if I was ok, I croaked out that I felt good but my mouth was dry. I got sponged and it felt good. She asked if I felt any pain and I said I was floating on a cloud. I couldn't feel any pain, not even my normal array of ouches and soreness. It was freakin' wonderful. Someone said something about having to cut a little of my hair and I remember saying "I don't care about my hair." I'm not sure how long it took to wake up, but I was remarkably awake when I finished. I was alert and practically bouncing in the bed. I didn't hurt at all, which was so nice I could hardly endure it. The rolled me back to the room I was in for pre-op, the one with my clothes and phone, and I got my phone back so I could read and tweet. In addition to tweeting, I took some pictures of my bandage since there wasn't a mirror handy. I tweeted, then messaged co-workers and husband to let them know I was fine. I was *really* hyper for a time, then I crashed quite suddenly into utter fatigue. I dozed while waiting for hubby-Eric, being interrupted by the nurse coming 'round to take my vitals. When I woke up I was hyper, but it would always end with another bout of fatigue. It was like I was bi-polar for a bit, except nothing to do with emotions, just energy. My mouth continued to be incredibly dry, and I asked for and got a lot of water. Eric arrived, and they sent him off to pick up my prescription of Percocet. While he was gone I made a trip to the bathroom and was still a little dizzy, so we decided to have me wait just a bit longer. The nurse put pressure cuffs on my legs to improve circulation. More water. Then I was ready to leave. The nurse called up the doctor, who told her that they weren't able to figure out why the lymph nodes had been enlarged. I was also told that they hadn't waited for the pathologist's report because the doctor was certain he'd gotten all of it out. I was given some basic instructions and told to go see the surgeon in a week to find out what's up. I'm still betting on cat-scratch fever. I got wheeled out to the car, and Eric took me home. My food instructions were vague, but I had a light dinner with Eric and lots and lots and lots of water. I'm still drinking lots of water today. I'm not as terribly thirsty, but it just seems very right to be drinking plenty of water. The pain has been minor so far. I had a single Percocet pill last night and it blessedly took almost all my pain away again. But the incision site really doesn't hurt all that much and I'm in a pretty good mood, all things considered. It's about 8 a.m. as I finish this. In about four hours I can take off the bandage and see what my stitches look like, get a shower and go to work. I'm to stay off my feet as much as possible in the meantime. I'm also very slowly eating a light breakfast. It was silly to think I could make it into work this morning, but they'll survive another morning without me. I hope. 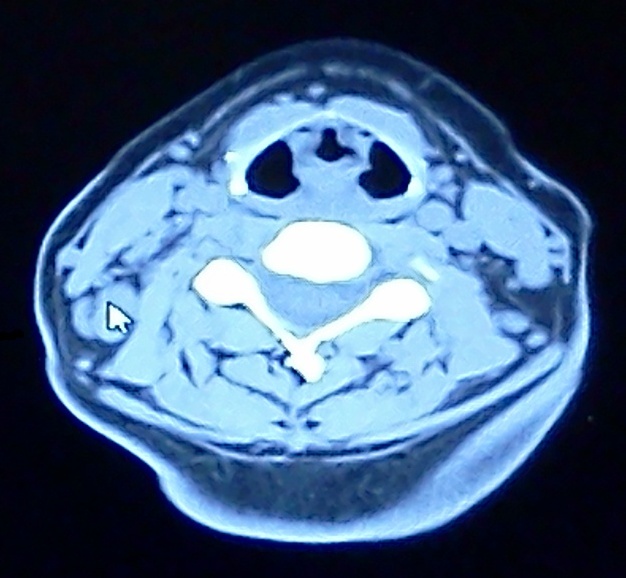 Close-up of the CT Scan picture showing the lump (under the cursor arrow).